Can 'banks on wheels' replace bricks-and-mortar? As increasing numbers of people choose to manage their money online, bricks-and-mortar banks are slowly disappearing from Scottish high streets. In some cases, they are being replaced by "banks on wheels" - vans which tour rural communities offering basic banking facilities to customers unable, or unwilling, to monitor their accounts online. They will be offered to communities like Beauly, near Inverness, and Douglas, in Lanarkshire, which will be left without a single traditional bank when their local Royal Bank of Scotland branches close next year. The mobile branch is already a familiar sight on the Machars peninsula in Galloway, where the last bank - a Bank of Scotland in Port William which was open only one day a week - closed in October. Residents in Whithorn lost their RBS branch in 2014, during an earlier tranche of closures. Now they have to embark on a 60-mile round-trip to Stranraer to visit their nearest traditional branch. 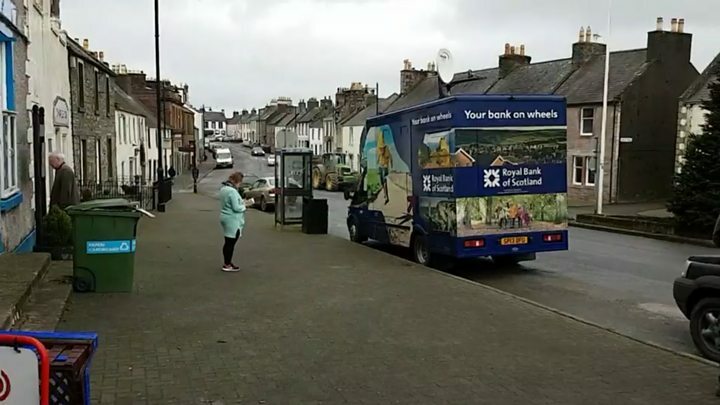 A RBS mobile bank visits the town for an hour, twice a week, enabling local customers to deposit and withdraw cash, pay bills and make balance inquiries. BBC Scotland spoke to some of the dozen-or-so people who used it last week. Lisa Templeton said she uses the mobile branch for her personal banking and to pay in cash from the vets surgery where she works. "I don't know what we'd do without it actually, now," she said. "We miss the bank being resident in the town, for handiness sake, but we know when the mobile bank comes and we use it. It meets our needs most of the time." Does she understand why the RBS left their permanent base in the town? "It's money isn't it?" she said. "But I don't think there's any thought about the effect it has on the rest of the community, the rest of the businesses in the town. "People would come into the town to go to the bank and they would use the local shop, they'd go to chemist, they'd use all the services in the town. "Take the bank away and they have to go to Newton Stewart or they have to go to Stranraer and they take some of their other business there with them. "I think the town's quieter than it used to be but whether you can blame it on the bank moving out or not, I don't know." She urged those in communities hit by the latest bank closures to ensure they made use of their banking vans. "If this is all you're going to get, you're going to have to support it otherwise you're going to lose that as well." The closure of the bank in Whithorn was completely understandable, according to local businessman Paul Soriani. He said the push towards online banking meant it was inevitable but he admitted that he did all his banking in person. The cafe owner said: "I'm digging my heels in. I'm very set in my ways with my banking. I don't even have any other option but cash in the shop." And although he was not ready to contemplate online banking, he had adapted to using the banking van once the branch closed. "I can understand that some of the older generation are struggling to get to bigger towns but I think they're comfortable with this," he said. "At the moment I'm set in my ways with my systems and this fits in with my routine." Joan Vickers, who lives in the nearby Isle of Whithorn, travelled to the banking van to pay a bill. She said the banks should look at more imaginative ways of serving their customers from their traditional premises. "We don't understand why they didn't just open two or three days a week, would that not have been better to have done that for people?" she said. "Or was there no way two or three banks could have joined together and have opened two or three different days? But it's pie in the sky probably. " Is it time for the government to step in to safeguard banking in rural Scotland? "I don't think they really want to," she said. "They've got enough on their plate. I don't think it really matters to them - they're not out here are they?" Gilbert Galloway uses the mobile branch to bank the takings from his shop, Galloway Stores, and to get change for their till. He said people no longer travel into Whithorn to use the bank, and he has seen a slight affect on his business. Did he think about changing banks? "Yes I did. And I went to another bank but then they closed down." He has a grim analysis of the situation: "I dinnae ken, I think they're trying to kill rural Scotland." Peter Buxton was planning to withdraw cash from the mobile bank when he visited. He does not trust online banking but he is not entirely satisfied with the mobile service. Asked if he would consider moving his money out of the Royal Bank of Scotland, he said: "And put it under my bed? "No. There's no other bank, and there hasn't been for a number of years. "The one in Port has gone, the one in Wigtown has gone, and the one in Newton Stewart has gone. It's getting more and more difficult to manage your money." The banking van which tours the south-west of Scotland is one of 20 operating in 324 towns and villages north of the border, according to RBS. A spokesman for the bank said mobile and online banking was easier and more convenient for some customers. He added: "Branches will remain an important part of our service, but we will have fewer and these will evolve as customer behaviour does - changing from the place where customers go to undertake transactions, to the place they go for help on big life decisions, such as taking out a mortgage or starting up their own business. "It's a tough decision to close a branch because some of our customers prefer to do their everyday banking face to face and we will help them with the alternative ways to bank in their community. "We are committed to ensuring we provide a range of alternative ways to bank, tailored to the needs of our communities and reflective of the way our customers live their lives."